The 1995 playoffs were pretty crazy. The Orlando Magic took down the Bulls despite Michael Jordan returning. The Houston Rockets shocked the world and won it all despite being a lowly sixth seed. Two surprising facts came from these two series. Don't look back, they might be gaining! Bob Neal was speaking the truth. Horace Grant was better (just barely) than Shaq, and together Shaq and Horace rant circles around Scottie and Michael. Of course Horace and Shaq’s great play may have come from playing a team lacking bigs. Against the Rockets they crumbled when faced with Hakeem’s Finals MVP performance. . . or did they? That brings us to surprise fact number two. Well at least they both got a trophy. 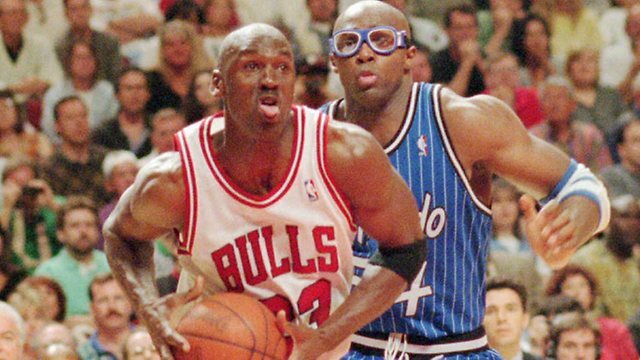 Sadly Horace Grant’s greatness disapeared in the finals. But the story wasn’t Hakeem outplaying the bigs of Orlando; the real story was how Clyde Drexler and Robert Horry destroyed the Magic from the wings. With no NBA in front of us for the foreseeable future, it is fun to go back to the past. Let us know if you have any weird stories you want us to look into and — provided we have time and there are no developments with the lockout — maybe we’ll look into it. * Don’t worry Mark, I haven’t forgotten about the Spurs, they’re on deck. Seeing Nick Anderson listed 6th here is petty hilarious considering he single-handily cost them game 1 and probably the series as a result. I guess you can be considered better than Hakeem as your team is being swept as you shoot 36% (28% in games 2-4) from the field, 30% from the FT line, and falling apart mentally, but i guess failing to tip in your shot a couple times does that. Anyone here watch the series? I did. Can anyone here truly believe Nick Anderson and Hakeem were close in this series (Dream put up 30/10 on nearly 50% and stellar defense and 5apg). No, really, Dream outperformed him in every category (except close on steals) in about the same minutes, yet Nick “0/4 FT To ice the game” Anderson outperformed him in WP. I think something is wrong, there. huge WP fan but have to agree with mettaworldpiece…something bad wrong here!?! This just illustrates the limitations of some, if not all, stats on reliably and reasonably representing the approximate contribution of a players entire impact on the game. The Most Valuable Player in my mind should go to the player on the winning team who can best be determined to have had the largest net impact in the series. This should take into account an estimation of what the outcome of the teams performance would have been without this player. In effect estimate how the team would have done with the said players replacement at his position instead and then compare the difference. If replacing him involves sliding players around then it can become complicated but the same logic applies. I believe Hakeem’s role for those Rockets both on offense and on defense was much less replaceable than Clyde’s, including in that series. Perhaps I am wrong but I believe the Rockets would still have won that series without Clyde, but would have lost without Hakeem. 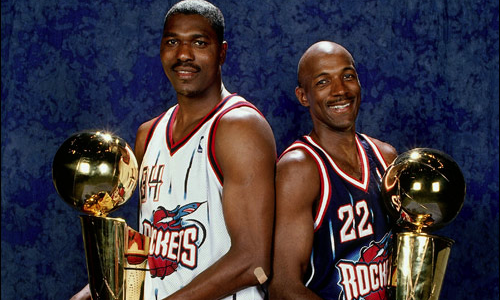 In any case my estimation of their respective net impacts on their team, and in that series, heavily favors Hakeem. The MVP was awarded properly for that series in my judgement.